Ideas can happen anywhere. Maybe you’re idly singing in the shower or perhaps lost in thought on your daily commute to work and ding! You get an idea for an app that will change the world. But how do you take the leap from idea to fully functional prototype? Hint: with preparation and interactive prototyping. But before you run to your nearest computer with lofty ambitions, it’s important to consider some essential first steps to prototyping a mobile app before you can start reaping the rewards. There’s no need to be a whizz kid or a coding genius either – all you need is an idea, Justinmind prototyping tool and a few steps to guide you along the way. And our 6 steps to successfully prototyping a mobile app will equip you with the necessary tools to fully realize your idea while minimizing any hiccups along the way. Shall we begin? Start by writing down a simple definition of your app. To help, just ask yourself which problem your app aims to solve. At this stage, nothing should be complex. For now, this stage is about understanding what your app will do, who will use your app and, importantly, is it necessary? This question is vital because 77% of users never use an app 3 days after installing it. With bleak statistics like that, mobile app prototyping is crucial to get correct. For example, if your app aims to join local farmers with people who want to buy organic, fresh produce something as simple as “P2P app to connect farmers and consumers” is sufficient at this stage. When thinking about how to prototype a mobile app, consider its unique selling point. Does your app solve a problem that many are experiencing? In the previous example, the USP could be that the app removes the need for intermittent and irregular farmers’ markets and removes the need for a middleman. Whatever your USP is, define it properly and think about whether it truly is unique and viable. Your idea may sound like a money maker in your head. You might even convince your best friend or your mom of your future riches. But you need to convince more than your closest friends and family. That’s where research comes in. 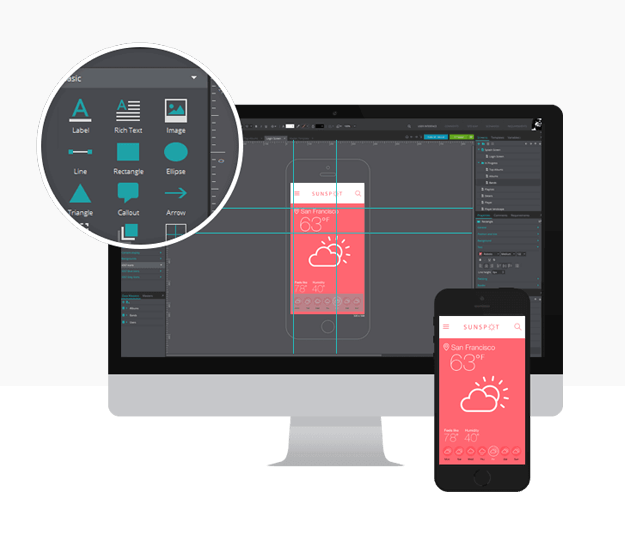 Jump to your computer, but don’t open your UI prototyping tool just yet. Understanding whether your idea is viable will play a role in its success so research is one of the most important steps to considering when prototyping a mobile app. Through your research, you will understand your end users better, reduce the risk of designing something poorly and, if necessary, offer confidence to everybody involved in the project (such as important stakeholders). Consider creating an effective survey using a tool like Typeform to gather responses to your questions. Using surveys will allow you to collect both qualitative and quantitative information that can inform your decision-making process going forward. They’re also a cost-effective method so you don’t have to spend a penny to get the information you need. Research will help you gain an understanding of the market and where your app is likely to fit in. But creating personas will contextualize your app and allow you to visualize who will be your key audience. 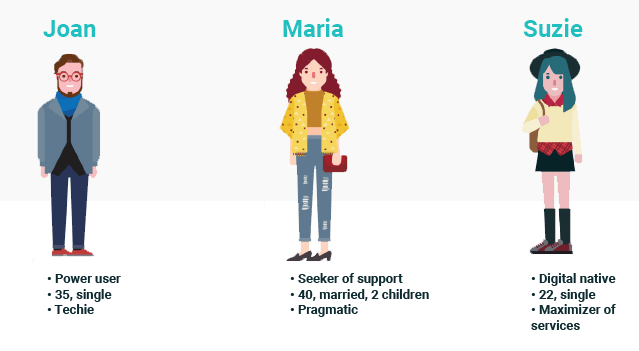 Personas are used in mobile app design to represent major user groups for your app, to express their needs and expectations, and help to uncover universal features. They act as placeholders for your real users. The most important thing to remember is that personas are only worth the research that goes into them. Don’t neglect this stage as personas are one of the most valuable tools in any designer’s arsenal and will prove vital further along in the prototyping process. Once you’ve understood your users’ needs and carried out sufficient research, you should be confident when it comes to app wireframing. Think of a wireframe as your app’s skeleton. That means no design elements, just the bare bones structure of your app. Traditionalists like to put their pen to paper and this is a great way to get some preliminary ideas jotted down. But with simple drag and drop in prototyping tools, like Justinmind, a fully functional wireframe can be whipped up in a few moments. The beauty of interactive wireframing is that you can quickly change the structure to ensure the best usability. Not only that but there’s a selection of mobile templates and UI stencil to choose from meaning that your wireframe will look authentic and you will have a better of idea of the elements you want within your app. When mobile app prototyping, a wireframe will help you gain clarity when it comes to early functionality, it’s adaptable and allows for early feedback in your early development stages – something that’s important in app design. Wireframing got you flustered? Our 10 wireframing dos and don’t will keep you on the straight and narrow. When you’ve refined your wireframe and got it as near to perfect as you would like, it’s time to put your mobile app prototype to the test. This part of the mobile app development process is insightful and offers the opportunity to learn and tweak your app. One of the most common methods of testing an app is to arrange and set up a usability test. A usability test is often one-on-one and a crucial component in the process. A usability test exists to determine how usable your app is and not whether a user likes or dislikes a element (this information isn’t useful at this stage, anyway). By implementing a usability test, you’ll gain valuable information such as how users perform tasks, how they interact with functionality and how they interpret label names. Iterating your tests as you learn from each user means you can tweak each version until you have arrived at a point where functionality is optimal. Usability Geek has a step-by-step guide to usability testing that will show you each step of the way. After carrying out usability tests, you’ll have gathered new information and discovered unnoticed pain points. Don’t worry – it’s normal that we miss things. That’s why usability testing is so valuable. You may find that in your head the navigation flow made perfect sense yet when put to the test, there were some bumps that disrupted the user journey. When carrying out a usability test, make sure to look for any patterns or problems that your participants experienced in their journey and note them down. Use this stage to take your feedback from users and stakeholders. Be aware that it will be impossible to take every comment on board so discern which changes will have the biggest impact. Our 6 steps will empower you to create your vision with little effort. From idea to robust wireframe to workable prototype, creating an app shouldn’t be difficult and with Justinmind’s ease of use and intuitive functionality anyone can be a prototyper.